There's a new demographic in play, and if you haven't already been introduced, now's the time. Broadcasters, meet "Generation C". Earlier this year, the "A students" at Morgan Stanley tagged onto a concept that smart operators like Canon have known for some time. Generation C transcends our longstanding notions about age, gender and ethnicity. Members include the oldest Baby Boomers through the youngest X-er's, Y's and Millenials -- the so-called "Echo Boomers". 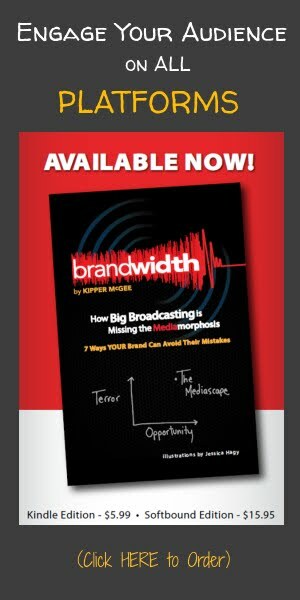 Broadcasters are just beginning to skim the surface of this rich vein of consumer desire and behavior. Meanwhile, social media outlets like Facebook, Friendfeed, Twitter and others are seeing dramatic growth in usage and revenues by filling the void. Other industries are moving down this road. Are you? How can you put the Age of Engagement to work for your media outlet? How can you best reach "Generation C"? In future posts...we'll explore the preferential differences between Email, Texting and Social Media -- and help determine which (or all) are viable for your brand(s). We'll also review the increasing presence of services like Pinterest, Snapchat, Instagram and the growing trend towards limited, 'walled' communities. Until then, may the best brands win! (There's still time to do a spring checkup on your brand plan. Don't delay. Contact Kipper today!